I missed this newspaper again. I didn't know it was published. Blogging about it now for reference and hoping that no matter how late this is, it can still inspire students to root for their respective schools through nail art. 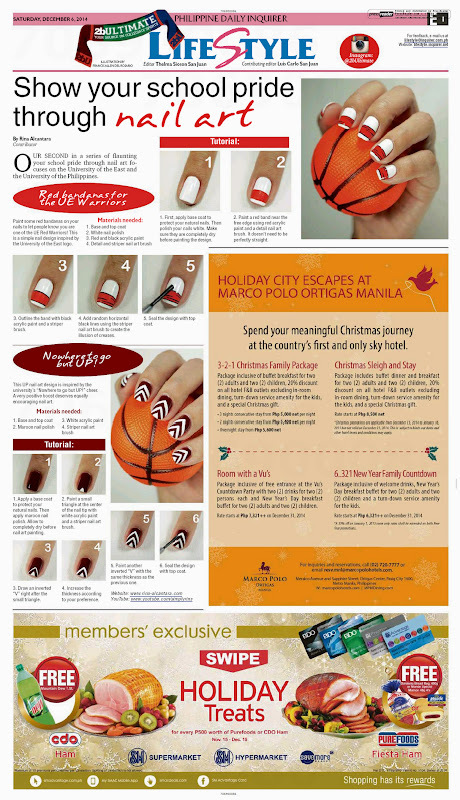 On December 06, 2014, Saturday, The Philippine Daily Inquirer published 2 more of my UAAP (University Athletics Association of the Philippines) nail art designs. For this issue, they decided to print the tutorial for the University of the East and for the University of the Philippines. The feature appeared on the Lifestyle section of the newspaper. Thank you once again to Philippine Daily Inquirer for featuring my work. Simply am telling you many thanks. I like to share these types of blog to my friends who like to read the blogs for gaining good thoughts and information. You can refer best essay writing service to get a best guidelines and suggestion to write your essays.